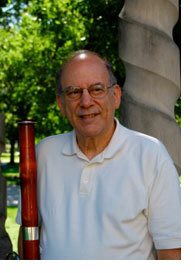 Michael Dicker Double Reed Services - Welcome! Welcome! Please allow me to introduce myself. As a performer and teacher of bassoon, I've been active professionally since 1967. Since the beginning of my career in the West Point Band, the bassoon has taken me all over the world and landed me in Normal, Illinois, where I've served as Professor of Bassoon for Illinois State University since 1986. I perform with Peoria Symphony, Heartland Festival Orchestra, and Sonneries Quintet. My studies of bassoon repair began with L. Hugh Cooper in 1970 and have been augmented by training at Fox Products in South Whitley, Indiana. During my residence as an orchestral player in Germany from 1979 through 1983, I also served as European Representative for Fox Products. My duties included both advising dealers and helping professional players in Austria, Italy, Germany, Belgium, Holland, and Switzerland with consultation and repair regarding their bassoons. Upon returning to the United States I became established as both an authorized Fox Dealer and a bassoon repair technician at the factory in South Whitley. My wife, Judith Dicker who is an accomplished oboist, joins me in this enterprise. She has had extensive experience performing and teaching in Europe and the United States. Judith currently occupies the position of Lecturer of Oboe at Illinois State University and performs with Heartland Festival Orchestra and Sonneries Quintet. I value her technical expertise and advice on all oboes that come through my hands. To help you choose the very best Fox or Renard instrument for your needs at the most competitive price. To be sure that instrument is in top shape when it's placed in your hands. To help you maintain your instrument in excellent condition with both advice and craftsmanship. To offer the best accessories you need at discount prices. I'm now a dealer for Christopher Weait Publications! Scale book offered - "Bassoon Scales for Reading" - Special Price! Contact me for further details. I've also become a dealer for Roger Garrett Bassoon & Oboe Reed Cases! These gems are wooden cases of the highest quality. You may custom order them in various woods including cherry, mahogany, etc. Each case holds six reeds. Call me for a Special Price!